Colonel “Runce” Rooney, who has died aged 96, had wide operational experience and a number of narrow escapes in an Army career which spanned 37 years. In 1943 Rooney accompanied 4th Battalion 1st Gurkha Rifles (4/1 GR) to the Arakan, west Burma, as part of 33 Brigade, 7th Indian Infantry Division. His first success was bringing in the heads of four Japanese soldiers that a patrol had killed. This resulted in a reprimand from the brigade commander, who wanted prisoners taken alive and reminded him that severed heads could not be interrogated. In January 1944, the battalion launched a dawn attack after a night advance across a mile of paddy fields. Ordered to clear an area against strong Japanese opposition, Rooney was shot in the chest while attacking a bunker. His wound was dressed at the regimental aid post but later in the day his condition became critical. The enemy controlled the evacuation routes, and so he was put on a stretcher and five Indian bearers attempted the dangerous crossing of the paddy fields. A short way across, they came under fire. One of the bearers was killed and Rooney was dropped into the paddy. The other bearers put him into cover until nightfall when they carried him to the medical centre. He was not expected to live and was put in a tent with another officer, who died during the night. A Japanese patrol attacked the centre and murdered all the wounded in the main ward, including many of the doctors and orderlies. They did not find Rooney, who survived and was flown to a hospital at Comilla in Bangladesh. Bertram Francis Louis Rooney was born in Dublin on September 15 1922 and was educated at the High School. A bout of meningitis kept him out of school for 14 months; his doctor prescribed a small carton of cream per day and a sip of champagne once a week. He represented the school at cricket, boxing and swimming and was capped for Leinster County Schools at rugby. In 1940 he won a German language prize and passed the entrance exam for Trinity College Dublin but decided to join the Army. He enlisted in the Royal Ulster Rifles, and on being recommended for a commission, opted for the Indian Army. In 1941 he did officer training at Mhow (now known as Dr Ambedkar Nagar) and was posted first to the 45th Cavalry in Poona, then to 4/1GR at Shinkiari and subsequently to Nowshera, northern India, (now in Pakistan). At a dinner party in the mess his recitation of Edward Lear’s poem, “The Owl and the Pussycat”, which contains the nonsense word “Runcible”, resulted in his nickname. After recovering from his wounds he was discharged and posted to the 1st Gurkha Depot at Dharamsala but decided that he must rejoin his battalion. He arrived at Kohima, where his comrades were rather surprised to see him. Having taken part in chasing the Japanese back to the Chindwin River, he was charged with being “absent without leave”, a court martial offence, but the commandant at the depot saw sense and the charge was dropped. He subsequently took part in the Battle of Meiktila and, after the end of the campaign, moved to Chiang Mai in Thailand to help to disarm 108,000 Japanese soldiers. After Indian Independence in 1947 he was posted to the 1st Bn 7th Gurkha Rifles (1/7GR) and spent most of the next 12 years on operations in Malaya. Flies spreading disease were a persistent nuisance and, at one camp, he was ordered to establish a fly-free zone. Rooney was the senior officer present when a general, whose idea this was, came to visit. A fly suddenly appeared. The general turned to Rooney, “Don’t you realise this is a fly-free zone?” he said angrily. After Staff College, he was posted to HQ British Gurkhas India as Deputy Assistant Adjutant and Quartermaster General. There, he had the exacting task of establishing a British depot in Nepal. He was single-handed, communications were poor and he had to travel widely while keeping on top of the HQ administration. He was appointed MBE. After rejoining his battalion in antiterrorist operations in Malaya, he was appointed brigade major at HQ 99 Gurkha Infantry Brigade Singapore. He then commanded 2nd Bn 7th Gurkha Rifles on four tours in Kalamantan and Sarawak in the Confrontation with Indonesia. He was advanced to OBE. 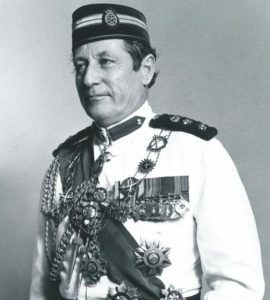 After a number of staff postings in Germany and Singapore, in 1972 he was appointed Commander Royal Brunei Malay Regiment. On returning to England, he moved to the MoD on becoming Deputy Director of Defence Sales, an appointment that involved travel to Egypt, the Philippines and South Korea. In 1977 he retired and, settled in Salisbury, for the next 10 years he took up a Retired Officer’s post as Military Secretary HQ SW District. He subsequently did voluntary work, arranging transport for elderly people attending day centres. Rooney worked himself and his men extremely hard. He had a great sense of humour and was a generous and entertaining host. He did not, however, suffer fools gladly and was never afraid to speak his mind whatever the rank of the person he was speaking to. Colonel “Runce” Rooney married first, in 1959, Beppy Van Der Leden, who predeceased him. He married secondly, in 1974, Veena Dutt, who was a stalwart support to him and who survives him with a son of his first marriage. Obituary taken from The Telegraph – 4th February 2019.